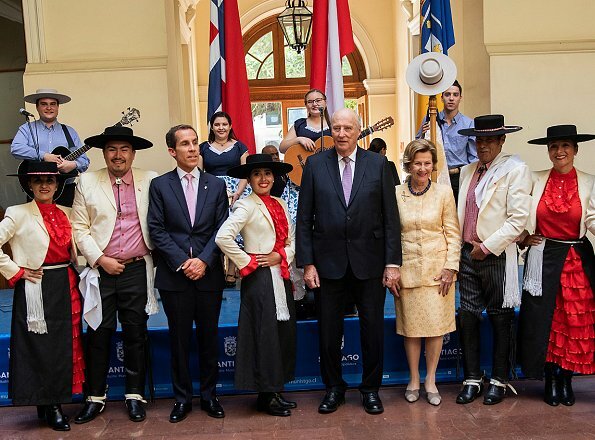 Norwegian King Harald and Queen Sonja are currently making a state visit to Chile upon the invitation of President of Chile.The state visit to Chile of King Harald and Queen Sonja continued, with a programme that included both business and culture. 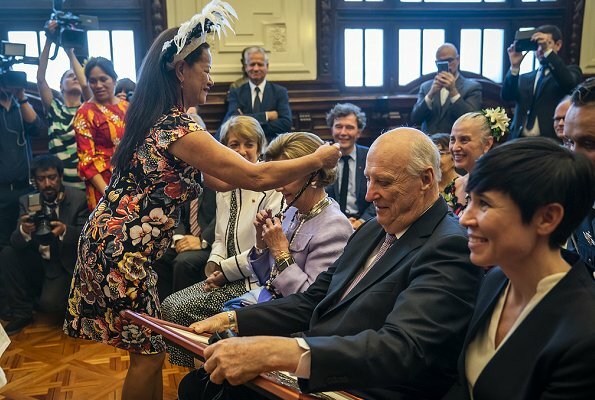 On March 28, 2019, The King and The Queen of Norway attended the ceremony marking the return artefacts and material from the Kon-Tiki Museum to Easter Island. 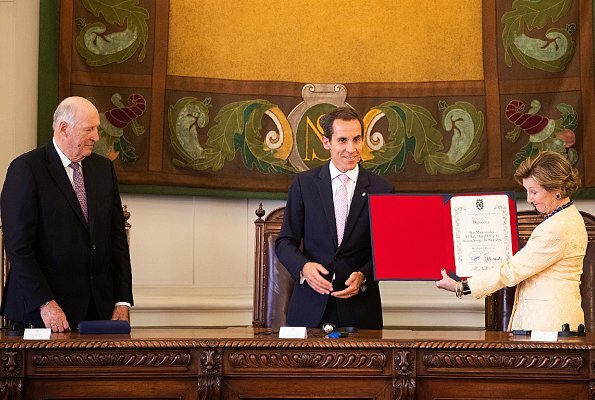 In the afternoon, The King and Queen visited the Mayor of Santiago, Mr Felipe Alessandri and the key of the city was presented to the King and the Queen with a ceremony held at the city hall. In the evening, The King and Queen hosted a friendship dinner. 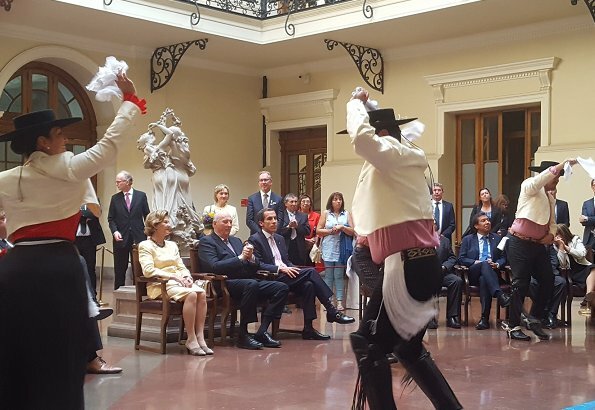 President Sebastián Piñera and First Lady Cecilia Morel Montes also attended the dinner. I agree! They are my favorites too! 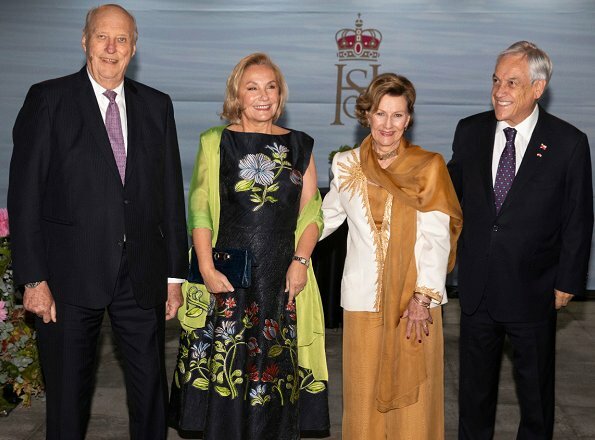 Queen Sonja is especially chic for the friendship dinner! I like the sun motif on the jacket, the fit of it and the evening trousers, plus the copper color. It is quite an unusual outfit and suits her well. Her shoes with the metallic gleam look very dressy. What a charmer she is. 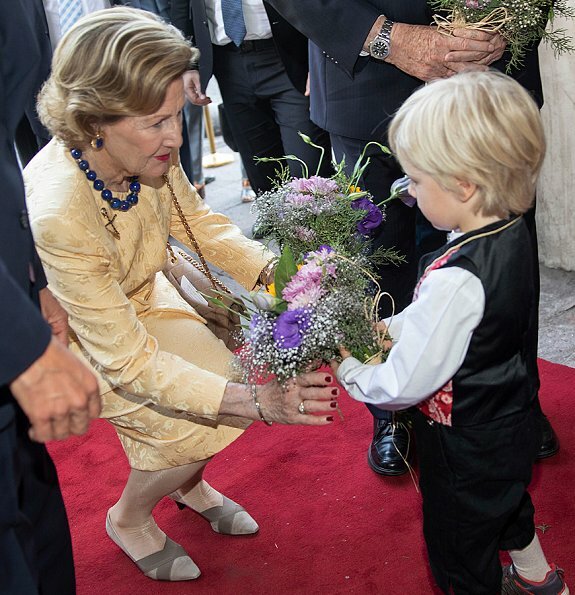 Queen Sonja looks very lovely. All the shell-jewelry she is really decked out now. Do love her evening outfit, the King is all smiles, love it. I like all the outfits. 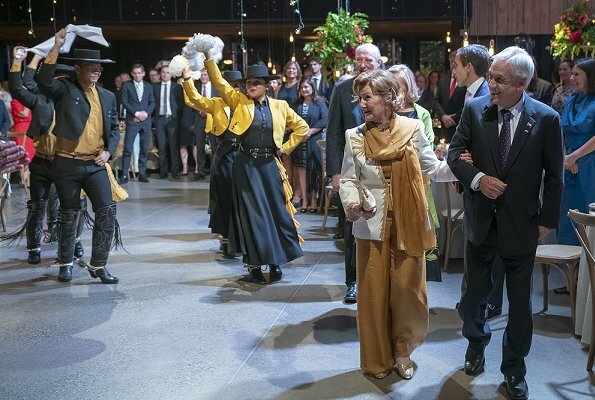 The outfit for the friendship dinner is outstanding! I would love to have a similar one myself. 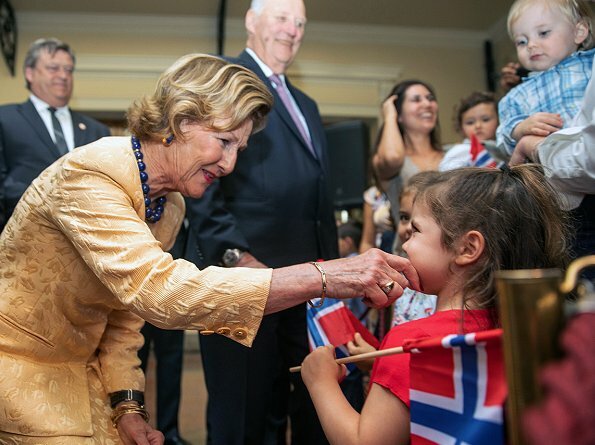 The pictures with the Queen and the children are very charming. 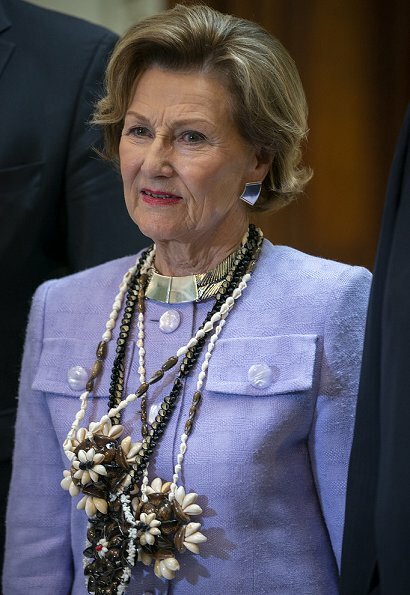 Love Queen Sonja's outfits and modern jewels! Both the king and queen always look so present at public functions, lovely to watch. Lile all these outfits but especially the one for the dinner. 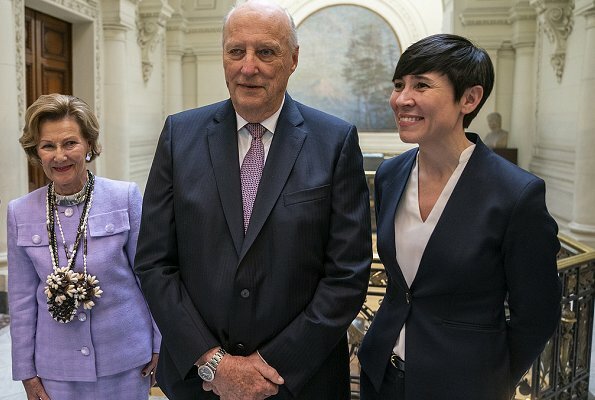 They look so fresh and modern but still totally appropriate on this octogenarian--though she looks years younger. Sonja hatte schon immer einen erlesen Geschmack und ein natürliches Stilgefühl. Das verliert man nie! Für mich ist sie ein modisches Vorbild, definitiv!